So I used to think that cauliflower was just a tasteless vegetable, whose sole purpose was to get ranch or blue cheese dressing into my mouth. I was wrong! Cauliflower is a great source of vitamins C and K as well as B-6 and folate. It’s really pretty easy to incorporate cauliflower into your diet, especially as a sub for rice and white potatoes, and you can even use it to make low carb pizza crust. 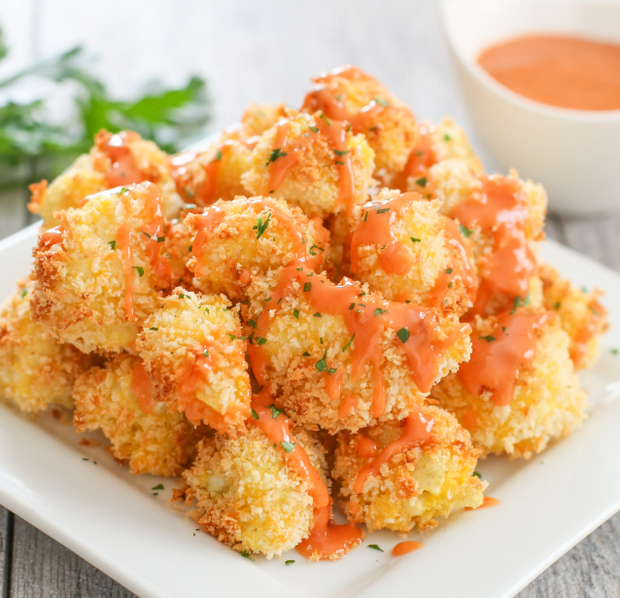 Kirbie Cravings has a great and super flavorful way to make cauliflower; use this dish as a side dish, appetizer, or even a main dish. Preheat oven to 400F. Dip cauliflower pieces in egg and then roll in panko until fully coated and place on a baking sheet lined with parchment paper. You will need to use your fingers to press on the coating to help it to stick to the cauliflower bites. Repeat until all cauliflower is coated. Bake for about 20 minutes or until coating is a dark golden brown and crunchy. While cauliflower is cooking, make the bang bang sauce. Add all ingredients into a small bowl and whisk until uniform and no mayonnaise lumps remain. Drizzle over finished cauliflower, reserving additional for dipping. Garnish with fresh parsley if desired. To make recipe vegan, use vegan mayo, egg substitute, and agave nectar. 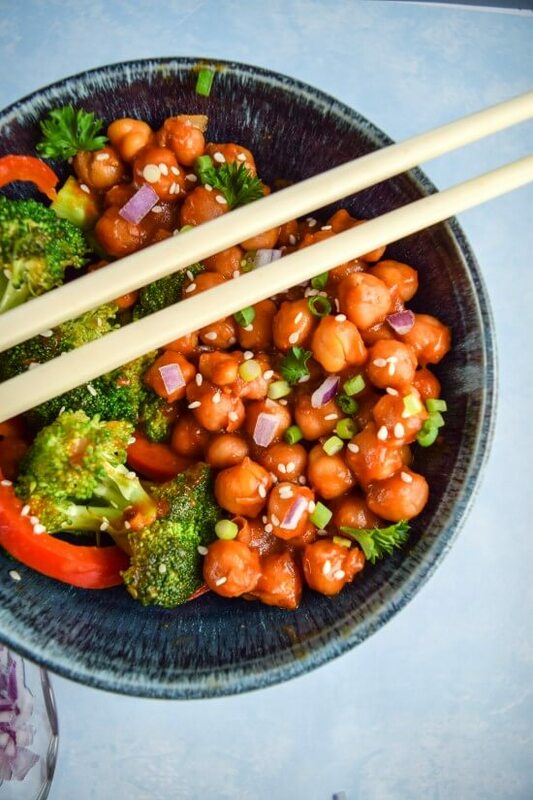 If you don’t like cauliflower, you can make it Bang Bang Shrimp instead. 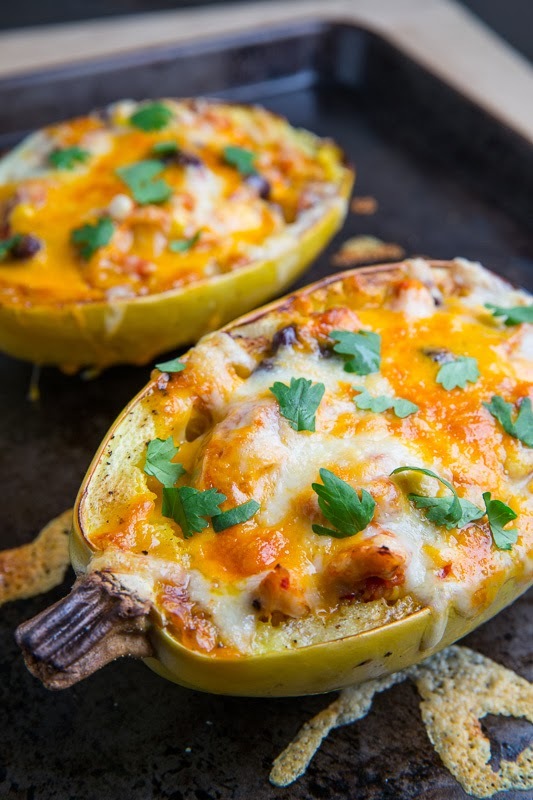 This Chicken Enchilada Stuffed Spaghetti Squash from Closet Cooking is one that I plan to try this week. Seriously, it looks amazing and so easy to make. Mix the chicken, enchilada sauce, beans, corn and cilantro, divide the mixture between the spaghetti squash and top with the cheese. Broil in the oven until the cheese has melted and turned a light golden brown, about 2-3 minutes. A quick and easy homemade enchilada sauce. Puree the onions and garlic along with the chilies and tomatoes in a food processor and return to pan. It’s almost chili season, so here is a recipe for White Chicken Chili from Health Starts In the Kitchen to get your started. Liberally season chicken breasts with seasoning. In a large dutch oven or heavy bottomed pot, heat butter over medium heat. Place chicken breasts, skin side down in pot and lightly brown (2-3 minutes). Turn chicken breasts over (bone side down), add onions, celery and peppers. Saute until soft, 2-3 minutes. Add water bring to a simmer. Cover and turn heat to low and cook for 1 hour. Remove chicken breasts from liquid, allow to cool enough to handle. Remove skin and bones (discard or freeze use in bone broth next time you make it) Roughly chop or shred chicken meat and add back into soup. In a small bowl or cup, whisk together potato starch/cornstarch and about 1/4 cup of the liquid from the soup until smooth. Add into the soup and stir well to combine. Allow thickener to cook in soup for 2-3 minutes then turn off heat and stir in coconut milk. Serve in bowls topped with chunks of avocado. It is also delicious served overtop of rice. You can add 1 cup of frozen corn and/or a can of white beans, if desired. You can find this recipe from Food Faith Fitness as a guest post on Julie’s Eats & Treats. It is a great way to get your fish taco fix, without the taco shell or tortilla. In a small bowl, mix together the cumin, smoked paprika, chili powder and a generous pinch of salt and pepper. Pat the Mahi Mahi fillets dry and divide the spice mixture between then, making sure to really rub it into both sides of the fish. Place on the grill and cook until white throughout, about 2-4 minutes per side. Transfer to a plate, cover and keep warm until ready to use. Add the chopped cauliflower into a large food processor, and process until the cauliflower resembles small rice grains. Dump the cauliflower into a large bowl and microwave for 2 minutes. Mix in the 2 Tsp of fresh lime juice and set aside. In a medium bowl, mix together the chopped mango, red onion, cilantro, lime juice and salt and pepper. Set aside. In a small bowl, mix together the Greek yogurt, lime juice, salt and pepper. Divide the cauliflower rice evenly between two plates. Top with a Mahi Mahi fillet and mango salsa. Garnish with chopped cabbage and sliced avocado and the yogurt lime sauce. 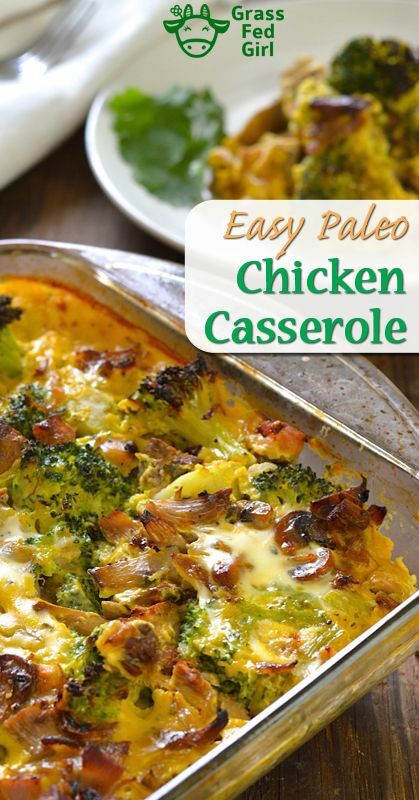 I found this lovely recipe on NomNom Paleo, but the recipe is actually from Diana Rodgers’s cookbook, The Homegrown Paleo Cookbook. It’s Paleo and full of tasteful herbs and spices. Heat the oven to 425˚ F with the rack in the middle. In the meantime, mince the veggies. Grab a large bowl, and combine the pork, mushrooms, herbs, and egg white (if you’re using it). Using a microplane, zest your ginger and lemon peel directly into the bowl. Here comes the fun part: Roll up your sleeves and combine the ingredients. Don’t overwork the meat, but make sure it’s mixed well. You can use the green herbs as your guide—as soon as they’re well-incorporated, STOP mixing! Line a rimmed baking sheet with a silicone liner or parchment paper. Roll each meatball in your palms until they’re smooth. Arrange the meatballs on the baking sheet, making sure to keep them evenly separated. Bake the meatballs in the oven for 12-15 minutes or until cooked through. Top with freshly chopped herbs and dig in! Paleo Grubs has an interesting Paleo twist on a classis Hungarian dish. Try it and let us know what you think! Melt the ghee in a large, deep pan or Dutch oven over medium-high heat. Season the chicken with salt and pepper and place into the pan. Cook for 4-6 minutes on each side until browned. Transfer the chicken to a plate and set aside. Add the onions to pan and sauté for 8-10 minutes until soft. Add the paprika, cayenne, and a dash of black pepper to the onions and stir. Add the tomato and chicken broth and scrape any browned bits from the bottom of the pan. Place the chicken back into the pan and cover. Bring to a simmer and cook for about 20 minutes or until the chicken is cooked through. When the chicken is done cooking, remove it from the pan to a plate. Whisk the arrowroot powder with a tablespoon of water and add it to the pan. Stir in the coconut cream, then adjust the salt to taste. Add the chicken back to the pan and coat with the sauce. Shred the chicken if desired. This shrimp recipe from Civilized Caveman is perfect for your Super Bowl Party, or really any party or meal. This recipe form Smile Sandwich is just about as quick and easy as they come. *Note: These are estimated quantities – you can just throw in however many vegetables and nuts you like! Drain the tuna and mix with the pesto. Add the pine nuts, tomatoes, and bell peppers and toss. Combine all ingredients in food processor and blend until smooth. You may need to add a bit of water to get the correct consistency. 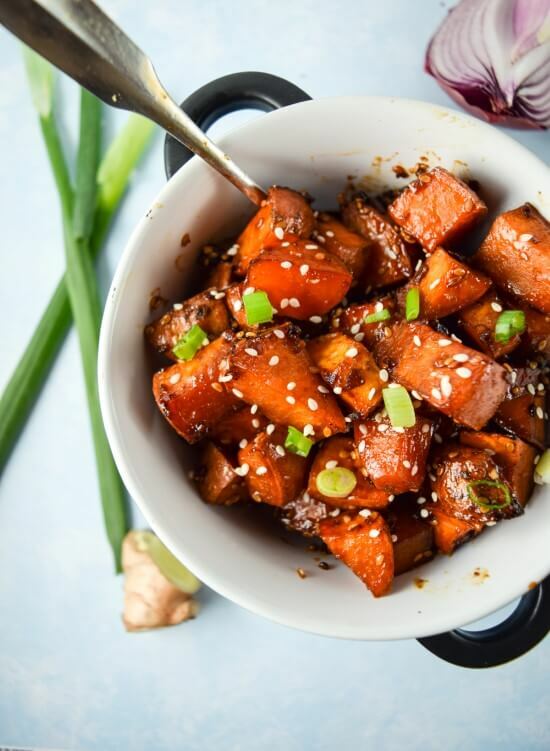 This is a Paleo, and Whole30 compliant, any meal recipe from Savory Lotus. It was listed on another site as an eggless breakfast, but you could honestly serve this for any meal and it would rock. 4 cups chopped sweet potatoes (the orange ones that are really called yams), chopped into 1 inch pieces. Combine all the spices and salt in a small bowl and set aside. Melt fat of choice in large pots and cook onions until begin to turn translucent and a titch brown. Add ground meat and garlic. Continue to cook until meat is completely browned. Pour in red sauce (or crushed tomatoes) and broth. Add spice mixture. Give it a good mix, cover, and let simmer for 5 minutes to meld flavors. Add sweet potatoes and celery, give another good mix, cover, and let simmer very gently for 40 minutes, stirring a a couple of times. Top with loads of avocado slices and fresh cilantro and serve. ENJOY! !